What's this!!!! Two Browns fans living in the UK. Can this even be real??? - A few comments about you : been playing madden since probably '08 which is where I got my favourite team from (dolphins) I can't play as them at the moment as it's to depressing for me. - A few comments about you : Spend most of my time watching/writing about sports, fan of Liverpool and the Jacksonville Jaguars, have found websites that are willing to let me talk about both. @MCFCDAP pulling strings ,well done bud. - A few comments about you : HUGE Patriots and Arsenal fan for many years! - Alternative Teams if your first choice is not available: Not fussed who I play as. - Do you play in any other leagues? If so, which? None. - Where did you hear about The EAFL? Derrick Porritt. I can't keep up with this. - A few comments about you : Massive Lions fan for the last 15 years unfortunately. Spurs fan also so used to disappointment. Played Madden on and off over the years. Just started playing American Football for a local team. - A few comments about you : Sports loving Evertonian! - A few comments about you : Been following the Cardinals for over 15 years, someone has to! 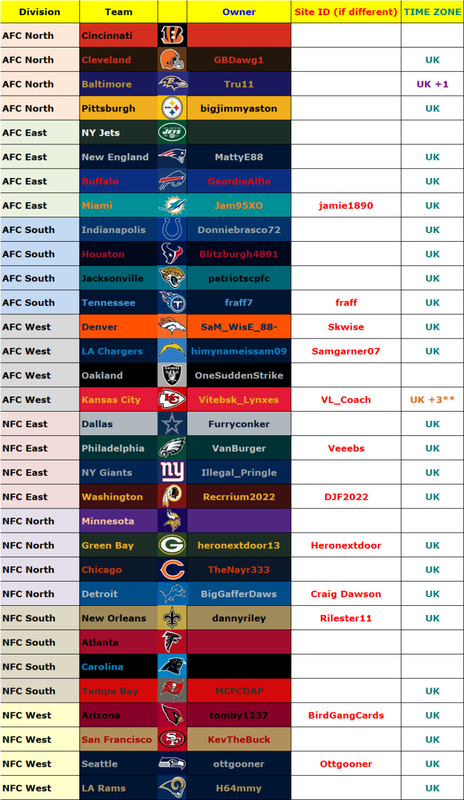 - Alternative Teams if your first choice is not available: Eagles, Bengals as a distant 3rd choice. - Where did you hear about The EAFL? NFL UK Facebook group and user MCFCDAP.